Less than 3 miles from Carmel-by-the-Sea you will find the Carmel Valley neighborhood of Brookdale. It is bordered by Carmel Valley Road to the north, Brookdale Drive to the south, Via Mallorca to the west and Quail Lodge to the east. Homes here are often located on large acre sized lots and offer valley views and gracious outdoor living. Situated on the Carmel River, these ranch style homes have sprawling yards many with swimming pools and permitted land use for horses. Mature landscaping and majestic oaks create a peaceful bucolic setting with privacy, while still maintaining close proximity to town. Brookdale is an ideal neighborhood for families with children as is part of the distinguished Carmel Unified School District. Homes in Brookdale are in high demand and very desirable. Home owners in this community have large and useable parcels of land ideal for outdoor living and entertainment. Comfortable and ideal for families, this neighborhood offers sunny Carmel Valley living just minutes from town and the mouth of the valley. Currently as of July 31st there are no homes active on the market. Year-to-date 2 homes have sold in this neighborhood; most expensive home sold for 1.375 million for a 3 bedroom, 2.5 bathroom, 2,630 SqFt of living space on just under an acre lot with direct access to the Carmel river, the least expensive home to sell was a completely remodeled 3 bedroom, 2 bathroom home with 2,070 SqFt of living space on an acre lot and sold for 1.325 million. Click here to preview all Carmel Valley homes for sale in the Brookdale neighborhood. For all available Carmel Valley real estate, click here. 2 homes sold in this neighborhood in 2018. The most expensive home sold for 1.375 million for a 3 bedroom, 2.5 bathroom home with 2,630 SqFt of living space, just under an acre lot with direct access to the Carmel river. The least expensive home to sell was a completely remodeled 3 bedroom, 2 bathroom home with 2,070 SqFt of living space on an acre lot and sold for 1.325 million. Only 1 home sold in this neighborhood in 2017. A bank-owned property with 6 bedrooms, 5.5 bathrooms, 3,865 SqFt of living space on a 1.23 acre lot sold for 1,123,200. There was only 1 home that sold in Brookdale in 2016. 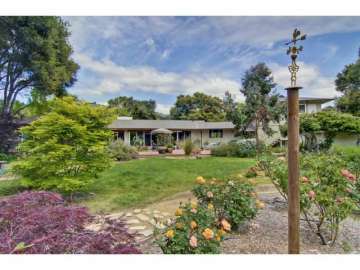 A 3 bedroom, 2.5 bathroom, 2,338 SqFt home on 1 acre that sold for 1.295 million. No homes in this neighborhood sold in 2015. 5 homes sold in this neighborhood. The most expensive home was sold for $1.1 million and was 2,500 SqFt on an acre of land. The least expensive sold for $710,000 and was 1,570 SqFt on a 43,996 SqFt lot. In 2013, the most expensive home sold in the neighborhood was sold for $1.75 million and was a 3,300 SqFt home on a 43,560 SqFt lot, while the least expensive sold for $685,000 and was a 2,752 SqFt home on an acre of land. In 2012 the most expensive home sold in the Brookdale neighborhood sold for 1.33 million and was a 4 bedroom, 4 bath home with 2,658 SqFt of living space situated on a level acre lot with lovely landscaping and room for horses. The least expensive home sold for 735K and was a 3 bedroom, 2 bath home with 1,140 SqFt of living space on a 43,560 SqFt lot complete with large patio, swimming pool and spa to enjoy sunny Carmel Valley days. Owning a home in the Brookdale neighborhood will allow you incredible access to the best the Monterey peninsula has to offer, from theatre and the arts to world class golfing and events there is an activity for everyone’s lifestyle. Quail Lodge & Golf Club is located at the eastern edge of the Brookdale neighborhood. Newly renovated in March of 2013, the guestrooms and suites at the Lodge have undergone a transformative makeover to give guests a comfortable place to escape, play golf and relax. There are dozens of golf courses in the area with sweeping views and challenging greens, perhaps most famously the seven world renowned golf courses in nearby Pebble Beach. Carmel Valley Road which borders Brookdale to the north will take you through a scenic drive through the valley surrounded by lush green mountains and jagged rock formations where the landscape unfolds into rolling acres of vineyards, equestrian estates, wine tasting rooms and lush golf courses. The atmosphere is relaxed and friendly and the weather almost always sunny, as it is far removed from the fog that can hover over the coast. Road cyclists will also enjoy the seemingly endless stretches of winding roads and panoramic views the valley offers. Carmel-by-the-Sea is just minutes away where you can explore on foot the quaint cafes, fairy tale cottages, superb boutiques and numerous art galleries in Carmel Village. Stroll down Ocean Avenue to Carmel Beach to watch dogs at play, sink your toes into the soft sand and watch the waves crash along the shore. With all of this at your fingertips, your home in Brookdale will provide you with a lifetime of experiences and memories to create in your very own Carmel Valley home.